He took Robert Frost’s words literally. With an offline google map, he rode through the valleys of Ladakh, exploring villages only the backpackers used to visit, and finding places to stay where there ain’t any. This is the story of Vishal Bhanushali who took a break from his decade-long career in animation and went out to experience the real world.Growing up in Mumbai, Vishal chose to become a professional in animation and VFX. After working in a studio for almost ten years he started his own studio in 2013. In 2015, Vishal took a break from his work and started to travel. From then on, the wonders of journeys got hold of him. Celebrating his birthday with the monks in Ladakh, a rendezvous with Sham valley, dreaming to go on a bike trip from Mumbai to Bhutan. Vishal Bhanushali is a person who found peace in travel and the memories it gave him. That break turned out to be one of the best decision he had ever taken. The more he travelled the more he learned. With all the expertise he has in animation and VFX Vishal made those experience into art, which tells his travel tales. Now his Instagram feed is donned with great pictures and a youtube channel with incredible videos. Apart from all this, his health became better. “One thing I’ve noticed is that when you are healthy you can make better decisions” Vishal says. From where the road ends, it’s a 6-hour hike to reach the Phugtal monastery in Ladakh. At Lamayuru, Vishal was disappointed to know that the trail to the monastery was inaccessible due to some heavy construction work. He had to pull out from his plan. But for a person filled with wanderlust and left with eight days in his itinerary, there’s always another place to go. With the offline Google map, he went to several places which only some backpackers visit. Many of them didn’t even have a homestay. In such places, local people offered him shelter. “I think that the people of Ladakh are some of the sweetest of the people I’ve met.” he said. With experience, Vishal has figured out a way keep the financial aspect of his travel in control. He uses hostels which provide decent stays at a nominal cost. He keeps in touch with the locals so that he can find places to stay amongst them when he goes there next time. And when it comes to food, Vishal always has a ‘mobile pantry’, so that he can prepare food on the go. It might not be anything big, but it can satisfy hunger, save a lot of time, money and nutritious. While he was travelling in Ladakh, he always carried some fruits, vegetables, bread and butter so that he can quickly make a sandwich whenever needed. 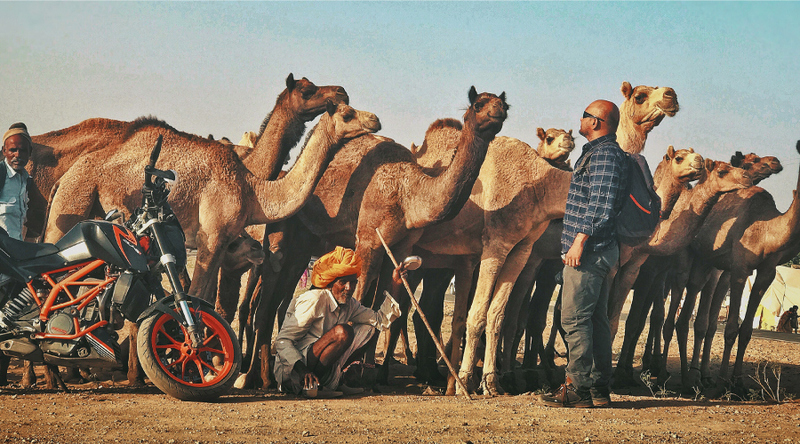 Vishal Bhanusahli found his peace in travel. He met a lot of people, learned about their culture and each and every journey left him craving for more.